God, the game is all your way, the secrets and the signals and the system; and so for the break of the game and the first play and the last. 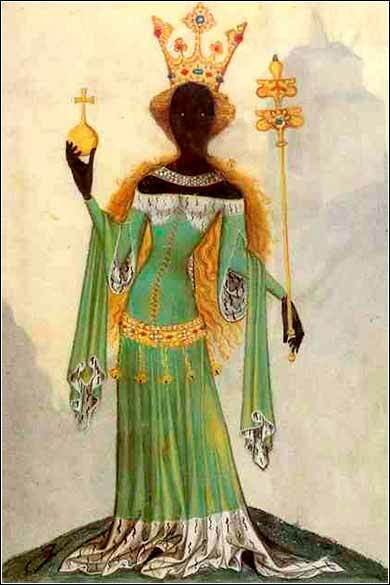 Queen of Sheba from a medieval manuscript, Bellifortis, by Conrad Kyeser, ca. 1405, Prague. The Queen of the South will rise at the judgment with this generation and condemn it; for she came from the ends of the earth to listen to Solomon’s wisdom, and now something greater than Solomon is here. Now when the queen of Sheba heard of the fame of Solomon concerning the name of the Lord, she came to test him with hard questions. She came to Jerusalem with a very great retinue, with camels bearing spices and very much gold and precious stones. And when she came to Solomon, she told him all that was on her mind. And Solomon answered all her questions; there was nothing hidden from the king that he could not explain to her. And she said to the king, “The report was true that I heard in my own land of your words and of your wisdom, but I did not believe the reports until I came and my own eyes had seen it. . . . Blessed be the Lord your God, who has delighted in you and set you on the throne of Israel! . . .Then she gave the king 120 talents of gold, and a very great quantity of spices and precious stones. . . . The Queen of the South is a second example or illustration of a point Christ is making, the first example being the people of Nineveh in the preceding verses, who heard Jonah's prophesy and repented of their sin. Like them, she was (by implication) filled with sinfulness, and as with all people at least some of this sin continued even after they repented of it: “for all have sinned and fallen short of the glory of God”. (Romans 3:23) In other words, Christ is not implying that she is fully righteous before God. Nevertheless, there were throughout the Old Testament people whose ears were open and who lived with hearts open to God, loving Him and yearning for his righteousness. It is these people, one might speculate, whom Christ sought to redeem in the three days after his death, prior to his resurrection. But even though she is not truly righteous, she compares favorably to the scribes and Pharisees who have become Christ's attackers. Her attempts to find God with an open heart compare so favorably to the attitude of the Jews that she will rise, at the Second Coming, to condemn them. regal attire of the period. We have included the entire passage concerning Sheba, because so much fascinating legend has grown up about her that it is sometimes difficult to remember that the Bible is not its source. Some of it may well be true, but it is not part of the Word of God. The legends about Sheba are numerous, detailed, and filled with colorful details. Two primary sources are the Koran and an Ethiopian book called Kebra Negast ('the Glory of Kings'). The most important, perhaps, is that she was the Queen of Ethiopia, also know as Queen Makeda. She slept with Solomon and bore a son by him and, upon her return to Ethiopia, founded a dynasty that lasted unbroken until the death of Haile Selassie, the last Emperor of Ethiopia, in 1974. Selassie, like his predecessors, had among his titles “The Lion of Judah”; one cannot overstate the glory of this title, for Judah was the tribe of Jacob and Jesus himself, and the lion is the symbol of Jerusalem. Selassie was (and is) worshipped as the son of God by the Rastafarian cult in Jamaica. Both Christian and Jewish legend has it that there were also immigrants of the Tribes of Dan and Judah that accompanied Makeda back from her visit to Solomon. And in fact, this might be true. There was a very odd Jewish enclave in Ethiopia called Beta Israel, which was suppressed in the 20th century and encouraged to emigrate to Israel.